At the initiative of Yunus Emre Institute in Skopje and with the support of MAARIF Foundation in Macedonia, at the Oriental Philology, within the Faculty of Philosophy of the University of Tetova, was organized a meeting of the departments of Turkology in Macedonia. 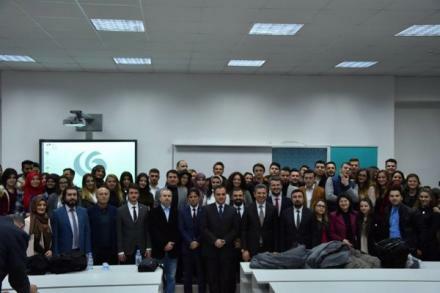 The host of the meeting was the Faculty of Philosophy of the University of Tetova, while the meeting was attended by over 150 students and professors of the departments of Turkology in Macedonia. On behalf of Oriental Philology, Prof. Dr. Sulejman Baki held a speech on Turkology who among other things said that he welcomed this initiative of meeting of students and professors of the departments of Turkology. At the same time, he thanked the institutions of Yunus Emre and TIKA for their continued support to Oriental Philology and the University. “We hope that this cooperation will continue even in the future”, said Baki. Also in this meeting, on behalf of the Faculty of Philosophy, a speech was also held by the vice-dean of the Faculty of Philosophy, Prof. Dr. Musa Musai, who welcomed this event. In addition to the greeting speeches of the director of Yunus Emre Institute in Skopje, Dr. Shemsetin Sheker and the MAARIF Foundation Coordinator for Macedonia, Mustafa Dillioglu, those present were also welcomed by the heads of Departments of Turkology at Ss. Cyril and Methodius University in Skopje, Goce Delchev University in Shtip and the International Balkan University.